Home To The West Indian Manatee! 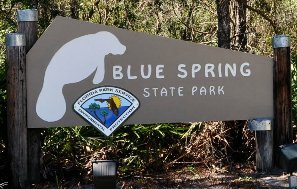 Blue Spring State Park located at Orange City Florida covers more than 2,600 acres, including the largest spring on the St. Johns River. Blue Spring is a designated Manatee Refuge and the winter home to a growing population of West Indian Manatees. The spring and spring run are closed during Manatee season, mid-November through March. The spring's crystal clear, 73 degree water can be enjoyed by swimmers, snorkelers, and certified scuba divers with a partner. The river is popular for fishing, canoeing, and boating. River boat tours are available, see details below. For overnight stays, air-conditioned cabins, a full-facility campground and primitive campsites are available. This is a very popular park on weekends. To ensure entrance into the park, they recommend arriving early; otherwise, the parking area will be full and you may not be able to enter. Swimming or diving with manatees is not permitted; this rule is strictly enforced, so follow all park instructions. Camping/Cabin Reservations: $95.00 (Cabin per night + tax) $24.00 per night + tax. Call 1 800-326-3521 or click this Blue Spring State Park link. Boat Tours: (386) 917-0724 or St.John River Cruises Takes around 2 hours. This is a popular venue with tourist's and locals, located around a 45min drive from Orlando, vehicles are required. We will keep updating this page via our RSS feed. regarding new additions, changes etc, so click onto the RSS feed above and follow the instructions to keep you on top off what's happening in and around Orlando, including updates for Blue Springs State Park.